Well, Janet, we do indeed miss you. For an update, my bag did show up on time, with no exploded toothpaste and tonight is Thursday: also known as Grey's Anatomy day. 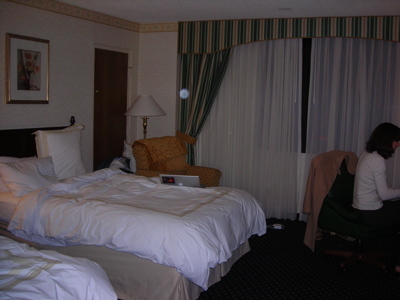 Here is a picture of your room at the Nashville Airport Marriott. You can see that Carrie is working diligently on her wiki and blog posts in the corner. We can do this because we have an upgraded room with internet access included. Ahh, the perks of being Janet. We promise that, in return for letting us steal your room at this very nice hotel, that we will blog, podcast, and wiki our hearts out until we can again be with you. Hey...is that a down-filled comforter??!! Sure looks like a great room, and I'm glad you two are there! Perks of Being at NWP: Stopping "that's so gay"